A part of me will always live in the city, though, and I just can't stay away for too long :) I still work in town, and most weekends, I am in town for something, whether it's hanging with friends, or checking out the big game (don't get me started on our Jackets this year, though. Sigh). This past weekend, it was Cirque du Soleil that drew me into town, to the blue and yellow tents at Atlantic Station. We put on our matinee outfits, grabbed a quick pint next door at Meehan's, and strolled in for the Sunday afternoon show of Amaluna. Amaluna was a fantastic experience. First of all, the vibe under the tent is awesome. The crowd sits really close to the stage, all 2,600 of us, and the seats go probably three-quarters of the way around the stage. That means that there is not a bad seat in the house! If you want to see the action really up-close, you can grab seats up front. Or, you can sit a bit further back to get some amazing full-picture views of everything going on. On top of that, there are circular parts of the stage that revolve so that everyone can see everything from every angle. One of my absolute favorite parts was the band. I noticed a big part of the show was made up of female performers. I found out later that my hunch was right -- the cast is 70% female! The band was all-female, and they brought out the electric cello for a number of the great ballads. I am a cellist myself, so of course I loved it! 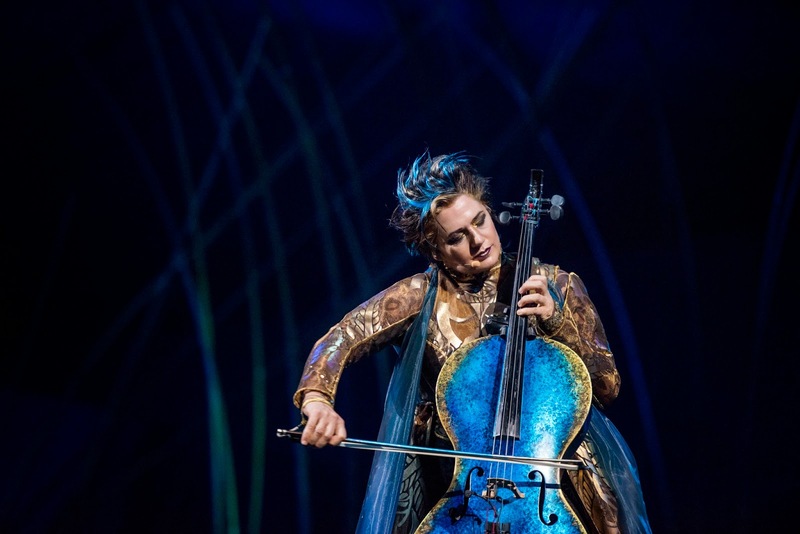 I always thought it'd be cool to play the electric cello. This woman rocked it. Seeing a show that's a self-titled tribute to the voice and power of women was empowering in and of itself. From the costumes to the acts, the show was wonderful. Just wait 'til you see what this performer does with the pile of sticks at her feet! 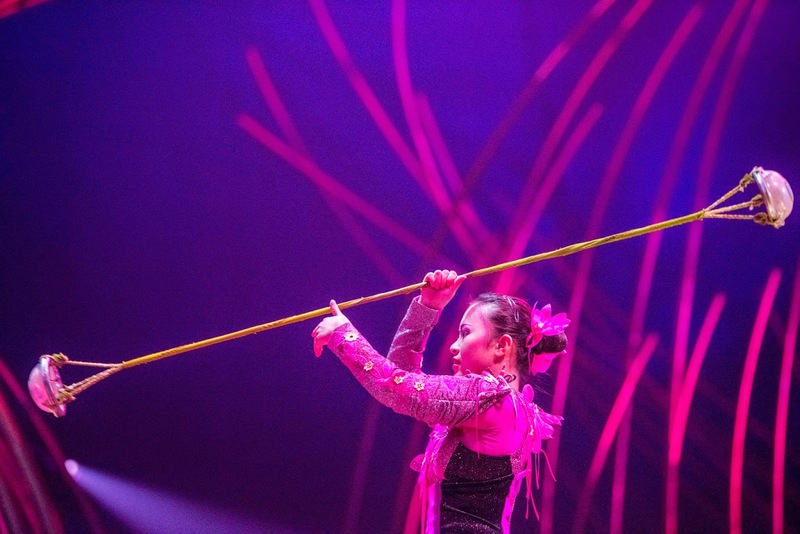 Celebrating its 30th Anniversary in 2014, Cirque du Soleil brings a new show to Atlanta. 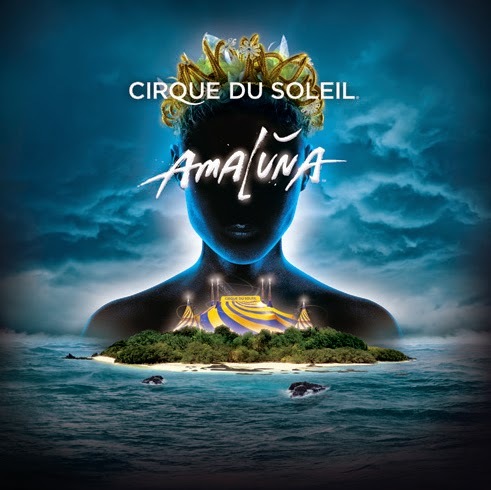 Amaluna invites the audience to a mysterious island governed by goddesses and guided by the cycles of the moon. Amaluna's Tony Award-winning Show Director, Diane Paulus, drew from a series of classical influences when creating the concept of the show -- including tales from Greek and Norse mythology, Mozart's The Magic Flute, and Shakespeare's The Tempest. Now playing under the famed blue-and-yellow Big Top at Atlantic Station until November 30, 2014, great seats start as low as $35. I have four (4) tickets to give away to lucky readers for the Wednesday, November 5th show of Amaluna, at 7:30PM. Ready to win?! Be sure to enter your info in the below form! Not so lucky on the giveaway? Buy discounted tickets here, thanks to Amaluna. Take advantage of this offer and buy four tickets for the price of three. Bring the whole family, or all the gals - and enjoy the show! Disclosure: I received two free tickets to the Amaluna show in exchange for this post. However, all opinions are my own! Thanks to Amaluna and Cirque du Soleil for the great afternoon! i have never seen of the shows and would be amazing to go and see it!!! Would love to see this show! And hope you're enjoying life in the 'burbs! I would love to go to one of these shows because I have never seen one. I have read about them and really would love to see one. I know it has to be absolutely mesmerizing! I always love when Cirque comes to town and am dying to see Amaluna! Love Cirque du Soleil shows! I have never been and this would be the best way to start the holiday season!! Thank you so much for the opportunity!!! I love when Cirque comes to town! I haven't been to an Atlantic Station show in years, Amaluna sounds great! You know I'm a circus girl! I can never afford the tickets when they come into town, so this would be the PERFECT gift for us!! We would love to take the family! I have never to a Cirque show before and it is something on my bucket list! I know it will be a great show! I love this! Thanks for the review. I've been wondering how the show is. I love Cirque and want to take my boyfriend to his first show! Their shows are so vibrant and inspiring! Would love to take another trip to the big top! I hope this isn't a duplicate.... I have seen 2 other shows in the past. ..they are AWE inspiring... they touch my soul. I am in need of soul nourishment! Thanks for sharing your experience. I would love to see the show. I would love the chance to see the show!